Pretty Me Up! : Rodial Skincare: Glam Balm & Glamtox Eye Light Review!! Rodial Skincare: Glam Balm & Glamtox Eye Light Review!! Rodial features Pomegranate Ellagic Tannin, nature's most potent collagen booster and firming agent. Your skin will feel renewed, smooth, firm and toned. By combining Rodial laboratory's scientific expertise and clinical testing with our unique knowledge of natural skin treatments, we bring you the ultimate in skincare. The Rodial products are dermatologically tested and are recommended by dermatologists and plastic surgeons in the UK. Read more about Rodial HERE!! 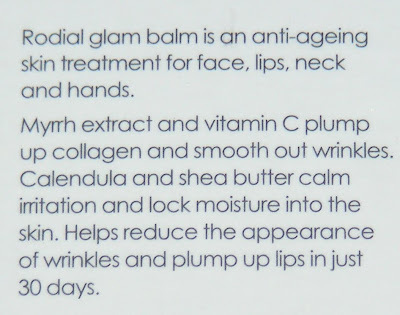 Rodial Glam Balm is an anti-aging multi-purpose skin treatment for face, lips, neck and hands. It nourishes, refines wrinkles and plumps up collagen on skin and lips. Rodial Glam Balm can be used as an evening facial treatment, during the day for a quick fix, or as a pre and post flight moisture mask. Who doesn't love a multi-purpose product?! This thick balm can be used for your lips, as a mask for hydration, on dry hands, and to reduce wrinkles on the face and neck! This ground-breaking product will not only reduce puffiness, but is clinically proven to help shift those stubborn dark circles. The cooling formula also refreshes, while on a deeper level oligopeptides work to restructure, repair and smooth the skin. Featuring a gentle SPF15, glamtox eye light protects this fragile skin against any further damage. When I put this under my eyes, it was so soothing. There is something in it to help depuff the eyes instantly! I think it might have light reflectors in it, because my eyes instantly looked brighter. I absolutely love this stuff! Highly Recommended!! The conversion sounds like it'd be expensive! :( But the eye treatment sounds really interesting!